As glaciers retreated from the last Ice Age, 10,000 years ago, they formed the scenic trail that beckons hikers. Photo courtesy of Wikimedia Commons. In “Marshland Elegy,” an essay in A Sand County Almanac, Aldo Leopold described a dawn wind slowly rolling a bank of fog across a Wisconsin marsh. “Like the white ghost of a glacier,” he wrote, “the mists advance, riding over phalanxes of tamaracks, sliding across bog-meadows heavy with dew.” It’s a haunting image that enthralls me each time I read the essay. Even if you’re unfamiliar with marshland and have never witnessed a fogbank in motion, the scene plays in your imagination like a film clip or a video. And the longer I live in Wisconsin, wandering its trails and walking near its wetlands, the more the “ghost of a glacier” seems not only an apt simile but also an encompassing presence on the land itself. Except for the “Driftless Area,” the unglaciated southwest corner of the state, Wisconsin’s landscape is rife with reminders of glaciers. The most recent glaciation, the Wisconsin Ice Sheet, receded 10,000 years ago, leaving a variety of formations that determine the contours of the terrain. Mile-high plows of ice scraped and gouged the surfaces they slid over. Where they stopped and melted back, the glaciers left moraines, hilly rows of gravel and rock, or drumlins, inverted spoon-shaped hillocks; they left eskers, the winding debris-strewn beds of rivers that flowed through the ice, and kames, earthen cones formed by till dropping through holes at the top; they left kettles, depressions in the earth where buried blocks of ice eventually melted when the glaciers retreated. The fens, the bogs, the marshes, the wetlands along the rivers and lakes—all testify, silently, to their origins in the glacial past. A great deal has happened to that glacial terrain in the last 10,000 years, especially in the last 200, as agriculture and commerce and transportation deposited all manner of dwellings, structures, and thoroughfares across it, the outwash and till of American civilization, the residue and distractions of easily-preoccupied populations. 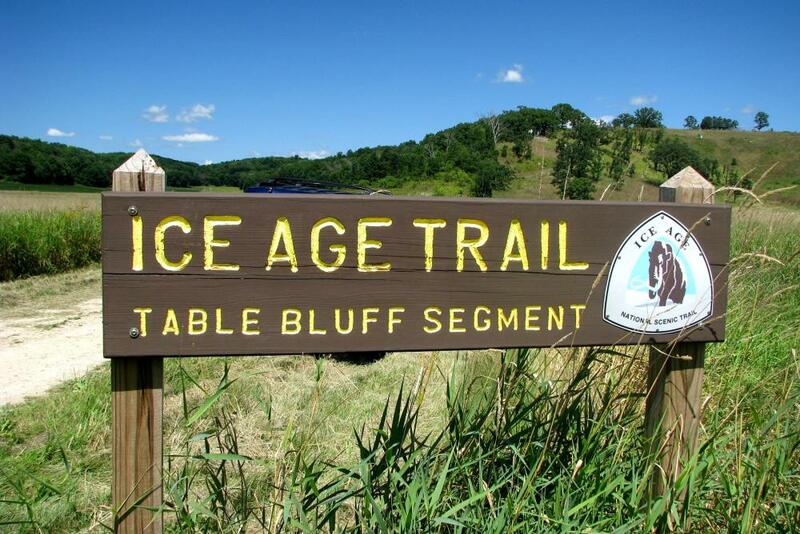 Today, in their determination to reach Wisconsin destinations of one kind or another, inhabitants and interlopers alike barely have a sense of the landscape they’re crossing, unless somehow they’re aware of the Ice Age National Scenic Trail. The Ice Age Trail winds across the state, following the terminal boundaries of the last ice sheet. At one end of the 1,200-mile-long trail it touches Minnesota; at the other end it looks down on Green Bay. More than 600 of those miles, a footpath well-marked by yellow blazes strategically painted on trees and posts, lead hikers over terrain rich in glacial reminders. To get a sense of the trail’s shape, picture a closed fist with one finger pointing down: The fist crosses the northern portion of the state from the St. Croix River almost to the Chequamegon-Nicolet National Forest; the chubby finger extends down almost to the Illinois border near Janesville, one side running through the middle of the state, the other eventually touching the shore of Lake Michigan. The northern portions of the trail are less populated, passing often through deep forest and wilder waterways; the eastern portions are seldom very far from villages and towns, farms and parklands. Maintained by a network of volunteers in chapters throughout the state, the Ice Age Trail always crosses natural features of the landscape, climbing moraines and eskers and kames, skirting kettles, fens, and bogs. Volunteer work on the Ice Age Trail began in 1957 and President Jimmy Carter approved the act making it a National Scenic Trail in 1980. In those 60 years, more than 160 hikers have walked all 1,200 miles of the trail. Some progressed incrementally, section by section over a period of months or even years, and about one-third of them hiked straight through from beginning to end, in a matter of weeks and sometimes in a matter of days. In the course of a year more than a million hikers and snowshoers, like me, wander shorter trail segments closer to home. The Ice Age Trail winds across the state, following the terminal boundaries of the last ice sheet. At one end of the 1,200-mile-long trail it touches Minnesota; at the other end it looks down on Green Bay. In the solitude of woods and wetlands, from the vistas of moraines and eskers, it doesn’t take long to feel connected to the earth beneath your hiking boots, to recognize a kettle or kame with a fond glance that may well be a greeting, to pause by glacial erratics carried down from Canada, and to look for striations and gouges in the surface of exposed rock. It becomes natural to welcome nuthatches, wild turkeys, herons, cranes, and deer whenever they appear. You don’t have to walk very long or very far to bring the landscape into you and to know it will stay with you when you leave the trail. Poet Wendell Berry, in “The Peace of Wild Things,” spoke of escaping despair by resting near the wood drake and the great heron, of feeling free when he can “rest in the grace of the world.” That’s very much what those of us who walk the Ice Age Trail feel, as if we have become a part not only of the natural world that surrounds us, but also of its history. We feel connected, somehow, across the ages. That feeling persists even after you come off the trail. To walk it is to acquire an abiding sense of where you are, as if you are never far from the companionable company of the white ghost of a glacier. Robert Root is the author of Walking Home Ground: In the Footsteps of Muir, Leopold, and Derleth and editor of Landscapes with Figures: The Nonfiction of Place.